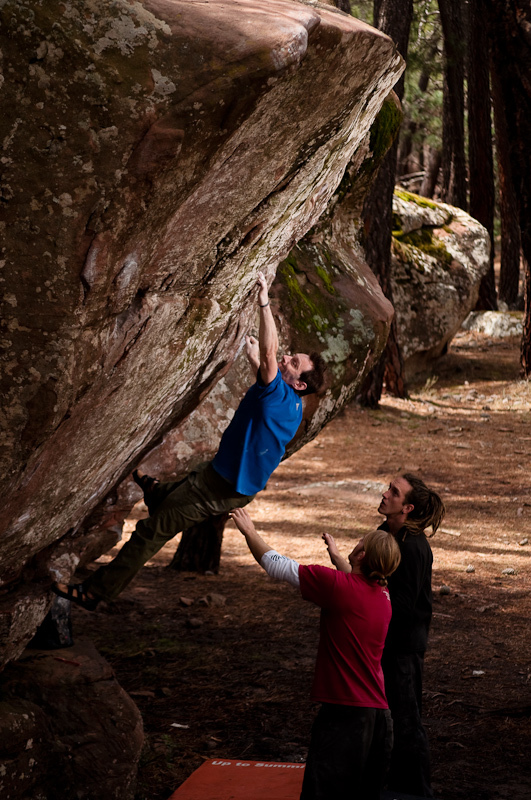 Bouldering is a style of climbing undertaken with minimal equipment, usually armed with your climbing boots, chalkbag and a bouldering mat you can conquor any climb. Well at least you can try…. Climbs are usually low level, and with this type of climbing people usually climb or attempt to climb at there limit. Protection is by the bouldering mat and a good team of spotters, bouldering is very often a social sport and heading out to the crag in a large group is not uncommon. It can be both rewarding and frustrating watching everyone else get to the top but that one day you get there first, the glory will be well worth the wait. Bouldering will take you to many magical places, it can be done in most weathers as you can find big roofs to secure some dry rock, indoors when its just too cold, and even on buildings and man made structures like bridges. Why not come out with us and experience the joys of bouldering, we’ll look at all the basics and the climbing etiquettes.